Spring has arrived! (Hopefully). With thawing ground and emerging sprouts, the work of Rebecca May Verrill comes to mind. 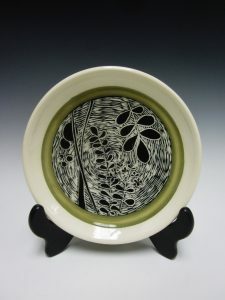 A Maine native, she strives to incorporate local clay and plant life in the surface design of her low-fire ceramic line. Rebecca adorns her modern forms with high-contrast glazing, earth toned slip, and meticulously hand-cut silhouettes of local flora. Fun Fact: When she isn’t potting in her studio at the Running with Scissors community building in Portland, you may find her making incredible hand-made corn tortillas, made with locally sourced corn and nori. They are sold at local markets under the name Torterilla Pachanga. Find Rebecca and her studio mates’ work here. Or see it for yourself at the Center for Maine Craft!